Last week I was walking to the kitchen and saw something swimming in the pond behind the house. I thought maybe it was an otter, but the way it was moving was different than I'd seen before. I grabbed my telephoto lens and went outside to get a picture and it went underwater when it saw me. 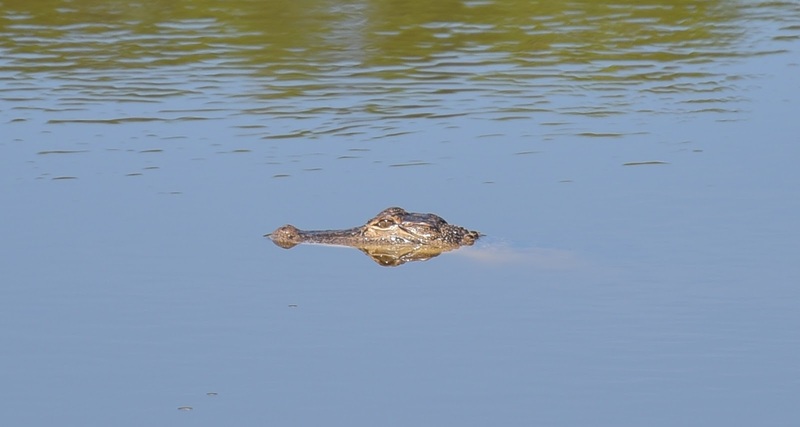 I waited a bit and when it came up I was pretty sure it was a gator. 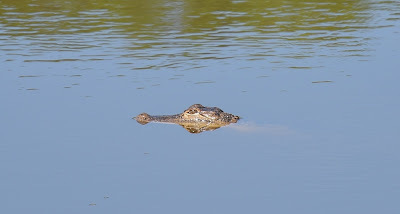 I took some pics and when I zoomed in on the picture I could see for certain it was a gator. It swam away from me, across the pond, and it never came out of the water so I couldn't tell exactly how big it was. We've been much more cautious letting Chloe out after seeing it. Andrea spotted it one more time that day, but we haven't seen it over the weekend and hopefully it's moved on to another pond.